This earthy salad combines a light lemon dressing with Swish chard and beans for a delicious and nutritious side. Bring a large pot of water to boil and cook the pasta until al dente. Drain, rinse and set aside. In a medium-sized skillet, heat 2 tablespoons olive oil over medium heat. Sauté the onions, garlic and carrots for a few minutes, then add the chard and cook a few minutes more until it is tender. Remove the skillet from the heat, stir in the white beans and set aside to cool. In a large mixing bowl, mix the lemon juice, olive oil, dried dill and mustard together. 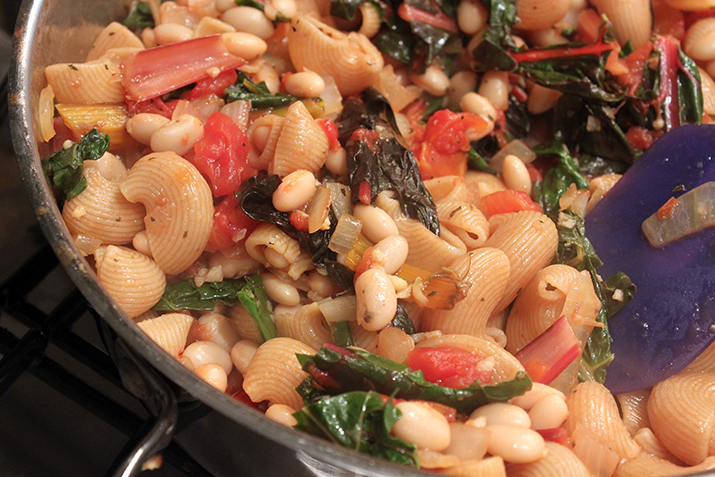 Toss with the pasta and beans and chard mixture. Season with salt and pepper, and gently stir in the grated Parmesan cheese. Serve chilled or at room temperature. Optional: Add sun-dried tomatoes, pesto, and small pieces of lox or chopped Kalamata olives for an additional flavor boost. This upscale yet earthy pasta salad is perfect for a luncheon or picnic, and pairs well with grilled meats, sausages, chicken or your favorite lasagna. Add garlic bread for an additional Mediterranean touch.